Veteran MPP Gilles Bisson denies he imitated Kaleed Rasheed. Ontario Premier Doug Ford exchanges words with NDP Leader Andrea Horwath during question period at Queen's Park, in Toronto on July 31, 2018. Ontario's Progressive Conservative government refused to answer questions from the Official Opposition on Tuesday after accusing a veteran NDP MPP of mocking the accent of a fellow legislator. A war of words erupted as the NDP peppered the PCs with questions on new legislation that aims to drastically reduce the number of city councillors in Toronto and cancel regional chair elections. 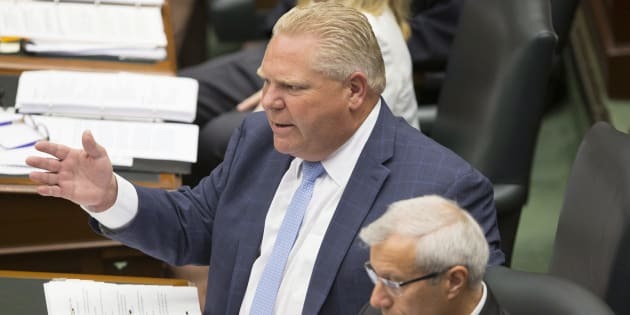 As Mississauga East-Cooksville PC MPP Kaleed Rasheed asked a question about the costs of a proposed Toronto referendum on Ford's cuts to council, Premier Doug Ford and NDP Leader Andrea Horwath could be heard shouting at one another. "You're disgusting!" Ford said, according to several reporters in the gallery. "You're disgusting! You're disgusting! Racist!" says Ford of an NDP MPP, who he claims imitated a PC MPP's accent. Horwath vigorously denies this happened (I did not see it). There is now some kind of Question Period time out, although I didn't hear the speaker declare one. The House Speaker eventually called a recess. PC House Leader Todd Smith later rose to blast the NDP. Tories accused NDP House Leader Gilles Bisson, the MPP for the riding of Timmins who was first elected in 1990, of imitating Rasheed's accent. The Speaker said he did not hear the comment, but the PCs demanded an apology from the NDP bench and refused to answer any questions until Bisson said he was sorry. Rasheed, speaking to reporters, called the alleged mocking "really disappointing" but said he did not actually hear it. "I am a proud Pakistani Canadian, of Pakistani origin, and I'm really proud of the party that I am in today," he said. Finance Minister Vic Fedeli, who sits opposite of Bisson, said he and other members of the PC caucus heard the alleged remark "loudly and clearly." After question period, Horwath slammed Ford while speaking to reporters about the brouhaha. The NDP leader, who sits next to Bisson in the legislature, said her MPP sent some "heckles" across the aisle but did not make any offensive comments. "Mr. Ford lies through his teeth, and he lied again today" Horwath said, adding that she was "disgusted" by his claims. NDP Leader Andrea Horwath exchanges words with Ontario Premier Doug Ford during question period at Queen's Park, in Toronto on July 31, 2018. Horwath accused the PCs of trying to "change the channel" from their shocking move to cut Toronto's city council, something she has charged is an act of "political revenge" on the part of Ford. Bisson then spoke to reporters and denied the PCs claims. "I was heckling across the House as I always do ... and I was in the midst of saying 'thank you for cancelling democracy' and I got cut off by other heckles. I know what I said," he said. "I have never, in my private life, in my public life, in my family life, or with anybody else, made disparaging comments about anybody in regards to their accents or where they come from." Horwath said the PCs were trying to ruin the reputation of a longtime MPP, and said Bisson had nothing for which to apologize. "You don't apologize for something that you haven't done," she said. "The premier is the one that needs to apologize."